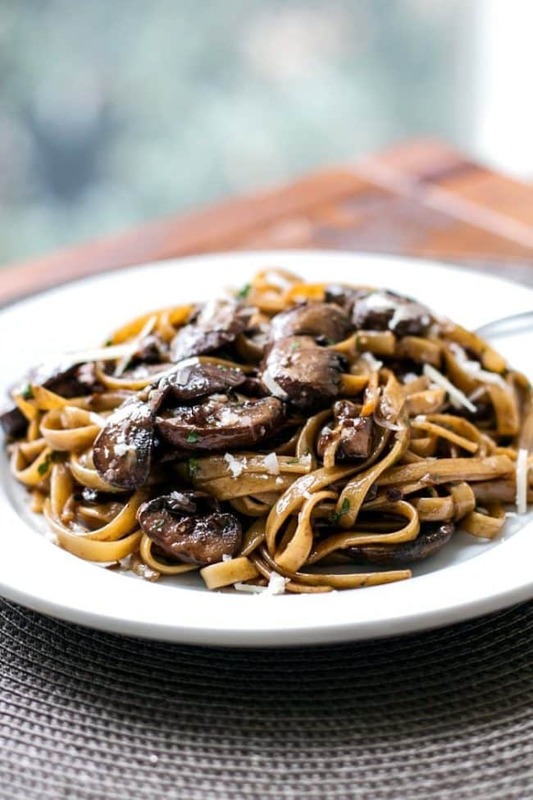 First published in January of 2015, this balsamic mushroom pasta for two is still a reader favorite. It’s one of those recipes that looks more complicated than it really is but, in reality, it comes together in the time it takes to boil the pasta. The mushrooms cook in some tangy balsamic vinegar and, just before it’s time to serve it, a little cream is added at the end that adds a touch of richness. Garnish it with parmesan cheese and dinner is ready in about 30 minutes. 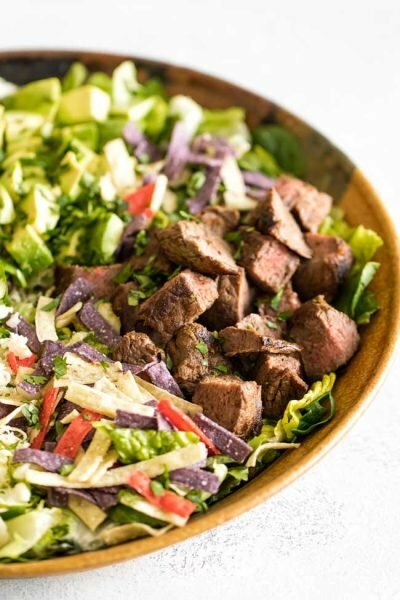 Salads, salads everywhere… except on this blog. As usual, I’m slow on the uptake and have yet to join the masses in the whole“it’s January so it’s time to make and blog about salad” thing. I figure if I have to take down the Christmas decorations (boo-hiss!) then I’m not giving up anything up food-wise – at least not until I’ve gotten used to the living room sans twinkle lights and garlands. How depressing to carefully wrap up all the ornaments and then have a salad for dinner. Nope. So, salads, you’re just going to have to wait. This plate of mushroom-y goodness was just what I needed after the Christmas decoration take-down marathon. Comforting, delicious, but so simple to make and it’s sort of fancy-looking, don’t you think? We all still need a little fancy decadence right now. 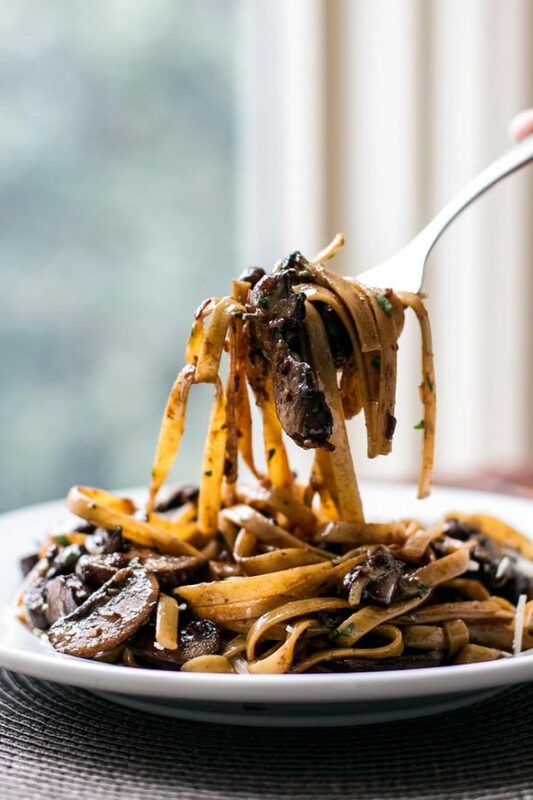 This easy balsamic mushroom pasta recipe makes enough for two people and I wasn’t kidding about how easy it is to make — first get a big pot of salty water going for the pasta. While you’re waiting for it to come to a boil, prep the shallot, garlic, and mushrooms (or buy the pre-sliced ones!). Once the water is boiling, toss in the pasta and start heating the butter and oil in another pan and get going on the sauce. 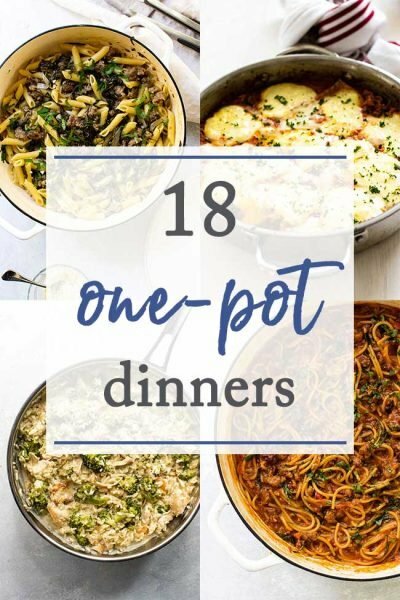 It comes together so quickly – just saute the shallots, garlic, and mushrooms in the butter and oil, deglaze the pan with some balsamic, and then add in the cream. By that point, the pasta will be ready to toss in the pan. Some Parmesan and parsley finishes the whole thing off. Take a bite and forget about all the salad nonsense – we can always start the diets next week. 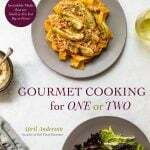 Want More Recipes for One or Two? 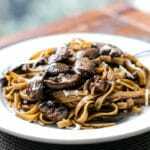 Mushrooms in a creamy balsamic sauce tossed with fettuccine pasta. It’s easy to make and so delicious! While the pasta is cooking prepare the mushroom sauce. In a large pan, melt 1 tablespoon of butter with 1 tablespoon of olive oil over medium heat. Once melted, add the shallots and garlic and cook for a few minutes or so, just until softened. Add the sliced mushrooms and toss them around to get them coated in the butter and olive oil. If needed, add an additional tablespoon of olive oil if the mushrooms get too dry. Let them cook and brown for about 8 minutes. Pour the balsamic vinegar into the pan and stir everything together making sure to scrape up all of the browned bits on the bottom of the pan. Add the other tablespoon of butter. Cook everything together for a couple of minutes and then turn off the heat and move the pan off the burner. Pour in the cream and parmesan cheese and stir to combine. Add the cooked fettuccine to the sauce and toss to combine. Add the fresh parsley and season to taste with salt and pepper (about a 1/2 teaspoon of each). This post has been republished from the archives and was first published in January 2015. Just tried this recipe. It had a wonderful delicate flavor. Awesome recipe. I add some lobster boiled in old bay, smoked paprika, himalayan pink salt, and pepper. Chopped. Delish. 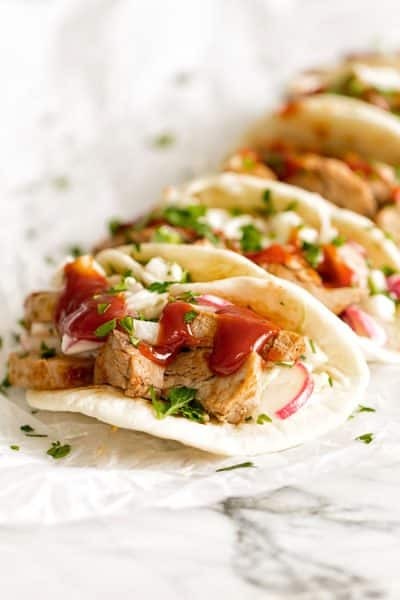 As soon as I discovered this beautiful flavorful recipe, I had to try it! Mmmm… This balsamic mushroom pasta is a real winner! I LOVE this dish! Even meat eating hubby will join me for dinner when I do this one! I have just found my go to recipe for the new year . Been working away from home now for the past month and wanted pasta that feels like you really fussed, but doesn’t take a long time to make. Not the usual cheese pasta, some thing a bit more sophisticated. OOOOH LOVE cheese sauce, don’t get me wrong,just need something more elegant. I just love this recipe and look forward to it so much.Ok, so thank you for the lovely recipe. Can you use bella mushrooms? Just tried this this weekend and it’s absolutely delicious! Thank you for sharing! I’m going to save this to make a quick week night dinner. Looks and sounds delicious. As far as I am concerned you can’t get much better than Pasta and your recipe looks amazing. We love mushrooms in my family so I am really looking forward to making it. how do you get that dark color on your fettuccine? Hi Nicholas! The pasta definitely picked up the color of the mushrooms and the balsamic, which is why they look dark. This is an amazing dish. I added chicken breast as my family requires protein. I browned the chicken in the sauteed onions and garlic. Once cooked, removed chicken and completed recipe as written. I then added chicken when I mixed in linguini. Thank you for posting. My family cleared their plates. Absolutely delicious! I followed your recipe and added 5 oz. thinly shaved sirloin beef also. Scrumptious! Thanks for a simple but amazing recipe. Ohhhhhh, my. Made this last night with a few tweaks–and it was incredible! Thank you so much for sharing this recipe. I can’t wait until lunch time so I can have the leftovers. This looks amazing. What kind of Balsamic Vinegar did you use? How does it taste with mushrooms? Hi Michalea! So glad you and your husband enjoyed it – and the brussels sprouts sound delicious! Oh I never thought about roasted Brussels Sprouts with this. I can imagine it would be heavenly…thanks for sharing! I added another tablespoon of butter to the sauce because there was a little too much balsamic for me but it was delicious! Thank you for a great recipe! Cream as in heavy cream? Can’t wait to make this! Made it for dinner was a huge hit. This was genius! Can’t wait to eat it again for lunch tomorrow! Made this last night for my husband and some company…everyone loved it..by far the greatest pasta dish I have ever made…so so delicious! Found this on pinterest and cooked it tonight, it was delicious! Now I’m browsing through your side and add tons of recipes I will have to try. I found this on Pinterest and tried it – it’s fabulous! The butter/shallots/mushroom/balsamic combo is now my favoritest thing ever. I can see this going well on toast, inside of a mushroom pie, with rice, etc. Thank you! Your photos are beautiful and this recipe is to die for! Forget salad, pasta FTW! I can’t wait to try it- thanks for sharing, April! 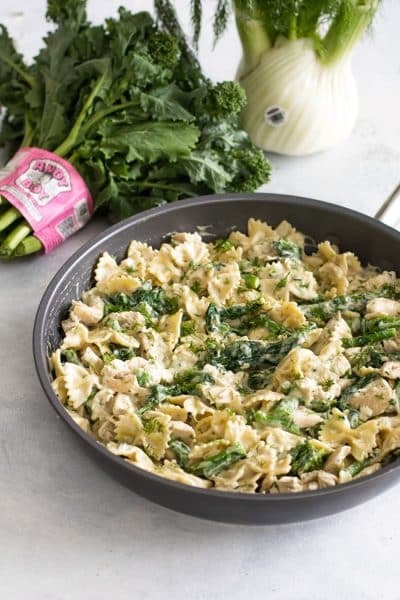 I am totally making this pasta tonight so easy and have all the ingredients already in my pantry! I cannot wait. Love this entree! I just want to sit down to a huge plate of it right now. Superb photos. Mushrooms and pasta never looked so good to me! YUM! You have captured an amazing dish beautifully! Love the photos! Oh my gosh this dishhhhh! I’m seriously drooling over these mushrooms! Oh my. You had me at Balsamic! So delicious. And your photography is stunning! WOW! I can’t believe how delicious this sounds! I have a love/hate relationship with mushrooms, but we’re totally ON right now. and I could eat pasta every day of the week, for real. I’ve got to make soon!! This definitely looks and sounds elegant! And yet so simple! I can’t wait to give this a try! Let me know how it is if you try it! You certainly can’t get anything better than pasta in my books, and this looks and sounds amazing. I love the combination of the balsamic and mushrooms. What type and brand of cream or you talking about? I’m learning how to cook, and would like to make this today. Heavy cream is what I used — any brand should be fine. I hope you enjoy it! I’m so glad you enjoyed it, Nicki!! Totally pinned this!!! Looks so freaking good and your pics are on point!! I just started blogging and can’t wait to have my posts look like yours! This looks AWESOME! It’s basically all of my favorite foods rolled up into pasta – I can’t wait to try it! This is wonderful! My husband even loved it! Thank you for a great recipe. I made this tonight and increased the number of servings. I used 16 oz. of fettuccini and increased the other ingredients proportionally except the balsamic vinegar which is perfect at 1/4 cup. This pasta is DELICIOUS! Paul Kriner, did you triple all of the ingredients including the cream? I know you said you left the balsamic vinegar the same but was wondering if the cream satayed at a 1/4 cups also or you tripled that too. Thank you! Hi! I think you’re okay to increase the cream to 1/2 cup to 3/4 cup. Start with 1/2 and if you think it needs more you can always add more once you’ve tossed the pasta in it. Pasta with garlicky sautéed mushrooms is a staple at our house. I can’t wait to try your version with balsamic vinegar. Let me know how it works for you, Jess! Thanks Jennifer – it’s definitely pasta weather right now! i tweaked by adding more mushrooms and a tsp of thick beef soup starter (better Than Soup brand) and it was amazing. My go to recipe now. Thanks for sharing. Thanks, Nancy! So glad you enjoyed it. Holy cow does this look good! Tweeted and printed it off to make for dinner. I can’t wait to try it – what a wonderfully simply pasta! Yum! This is my kinda dish!! So earthy and beautiful! What a GORGEOUS dish. I cannot wait to make this. Outstanding! Thanks so much, Maureen – I hope your husband is feeling better! It is so sad to pack up the decorations, isn’t it? This looks like an anything-but-depressing kind of meal! Looks delicious! I happened across your blog today – gorgeous! I’m a serious mushroom lover, and put this one at the top of my must-make list! Thanks so much, Dena! I love mushrooms, too – let me know how it works for you! I had to let you know how absolutely fabulous this mushroom pasta turned out. Even though I forgot to buy cream, since I had the mushrooms and the other ingredients, I forged ahead. When I added pasta to mushroom mixture I added some pasta water to make up for absence of liquid. 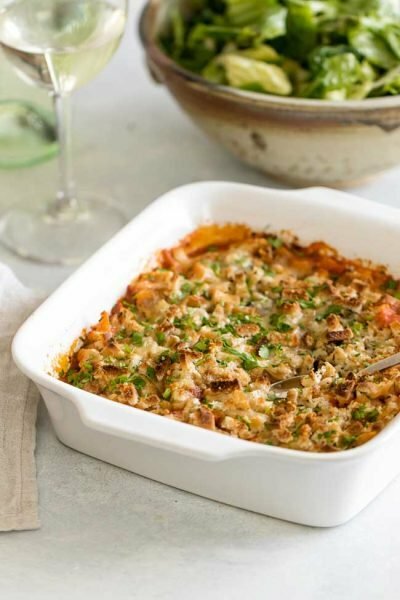 This recipe can be used for a dinner party or for a fast delicious meal that looks like a picture. Thank you so much for sharing. 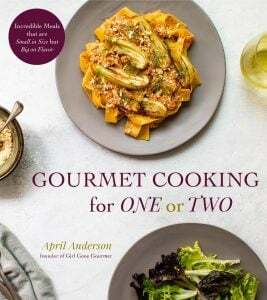 April – I tried clicking on five stars but it kept bouncing back to four. Great recipe for vegans too. Eggplant is a great idea! 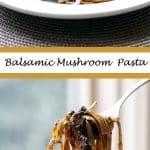 Hands down the BEST pasta recipe I have seen in a while.. this balsamic mushroom pasta looks incredible! I have to make the recipe, thanks for sharing it. I completely agree that it feels to early for the January health kick. I think O’ll feel more like it on Tuesday when my little one goes back to school and life gets back to normal, but right now I’m still finishing off all of the Christmas goodies in the kitchen. This pasta look delicious and so simple to make, I’m going to add it to my (ever growing) list of things to try. This looks ah-mazing…mushrooms are my favorite thing in the world. I wonder how this would taste substituting the pasta with zucchini noodles? ?